• Hourly Audio Annoucement & Alarm with 3 different sounds. • Dial Size: 1 3/8". 1. 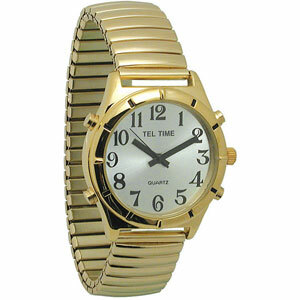 Gold Case with Crome Dial & 1-12 Black Numbers - Gold Expansion Band. 2. Gold Case with Chrome Dial & 1-12 Black Numbers - Black Leather Band w/Gold Buckle. 3. Gold Case with Black Dial & 1-12 White Numbers - Gold Expansion Band. 4. Gold Case with Black Dial & 1-12 White Numbers - Black Leather Band w/Gold Buckle. 5. Gold Case with White Dial & 1-12 Black Numbers - Gold Expansion Band.